I absolutely love wine bars (amongst many other things), so I was very excited to attend a press dinner at Sofia Wine Bar this past week. 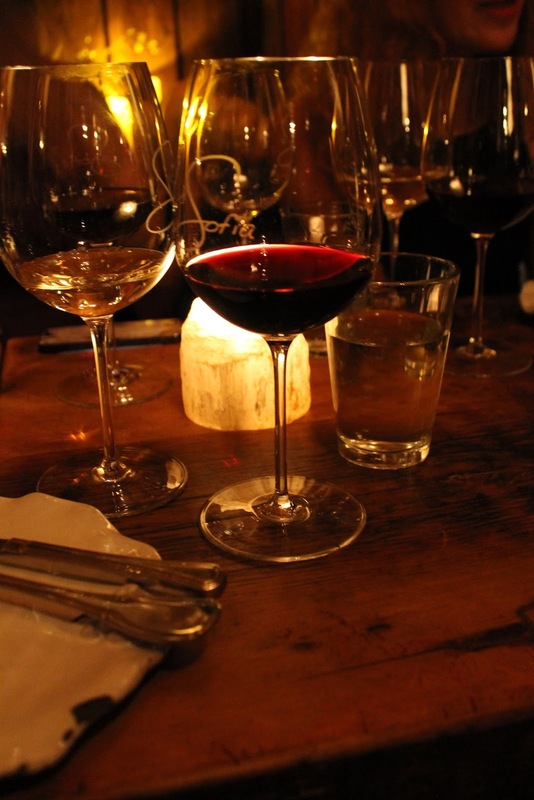 The food and wine were very good, and I had such a great time meeting the other bloggers! Sofia Wine Bar is a very cozy restaurant owned and run by an Italian couple and their son. Most of the recipes have been passed down from generations, and almost everything on the menu is made from scratch in-house. The restaurant was buzzing on a Monday night. Every table in the front dining room (seats around 25) and bar stools were occupied. We were seated in the back dining room where there are around 12 seats. It's definitely a nice spot to consider for small dinner parties. There isn't a whole lot of food items to choose from, but it is a wine bar after all. The restaurant offers around 100 wines all selected from small estate vineyards. Stuffed Mushrooms & Artichoke: A terrific appetizer with so much flavor. Everything on this plate went together well. Meatballs & Tomato Sauce: I really liked the tomato sauce. There was a nice thickness to it that helped it stick to the meatballs. Bruschetta Trio: Bruschetta topped with olive tapenade, tomato, and ricotta with honey. There was a great ratio of spreads to bread. My favorite one was the olive tapenade. Both pizzas were decent, but not exciting. I'd stick with the smaller plates. These cannolis were superb! And I'm not just saying that because dessert is always my favorite part of the meal. These cannolis are imported from Sicily, and the fried pastry was nicely crispy, and the cream cold and very fresh. The final wine pairing for the dessert was a Moscato. It was deliciously sweet and I could definitely go for 2 glasses of it next time. *This meal was complimentary, hosted by the restaurant as part of a press dinner.